It appears to me as though there has never been a complete release of this terrific score (feel free to correct me). It seems astounding given what a classic film and score this is. Any insights as to why this might be? If you are talking about the original tracks, it's easy enough to speculate. They don't exist anymore. Rhino released about every available minute on their 1997 CD, generally from the mixed film tracks. As to why someone has not done a complete re-recording of the score, I suspect it's because so much of it revolves around the song "As Time Goes By" that a full recording would become monotonous. Charles Gerhardt pulled out most of the major themes for his 9-minute re-recording for the RCA Classic Film Score series. There was a CD release with what they could salvage from the original tracks. I'm not so surprised that's all there is, to be honest. Sure, the film is a classic, but the music is famed mostly for "As Time Goes By" (not by Steiner, and not hard to find) and "La Marseillaise." It's a score made up of disparate short bits that, to me, don't really come together as a musical experience. Obviously, you may well disagree. The 8:44 suite conducted by Charles Gerhardt is satisfactory to me. Edit: I see that Mr. DiMucci made the same points, and did it quicker! 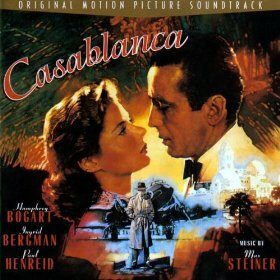 The old Max Steiner Music Society cassette tape issues had 23 minutes of Casablanca acetates in their collection.